Question #1 - Why didn't you include more recipes? All those cupcake flavors sound SO good! I didn't include more recipes because every recipe we put in the book, I had to make up myself. My publisher wouldn't allow me to "copy" recipes from any cookbook or from the internet. While I love to bake, I'm an author, not a professional baker. If you would like to make more of the cupcakes you read about in the book, try doing an on-line search of the cupcake flavor you are interested in. There are all kinds of great recipe sites, www.allrecipes.com being one of my personal favorites. More than likely, you will find a recipe for the cupcakes you'd like to make. If not, you might find something close, and then you can experiment and see what you can come up with! Happy baking!! Question #2 - What is wrong with Isabel's mother? Why did you make her that way? There are all kinds of people in this world. And sadly, not everyone is a great parent. I think Isabel's mom, Caroline, probably needs some professional therapy. But sometimes families have a hard time recognizing that and seeking it out. Does Isabel take on more than a 12-year-old girl should in regards to her mother's issues? Yes, she does. And so do millions of other kids across our country who have parents who are alcoholics or drug addicts or any number of mental illnesses. I'm not advocating that children take on their parents' problems or take on the parental role as children. But I am acknowledging that in some families, this happens. And I hope some kids read this book and feel a little less alone in the problems going on in their homes. Question #3 - I would love to have a discussion guide for my students or book club members. Is this something you might be willing to provide? Good news! The fabulous Tracie Vaughn Zimmer helped me prepare one. If you'd like a copy, just e-mail me at lisaschroederbooks(at)gmail.com and I'm happy to send it to you. Question #4 - Did Isabel win the baking contest? Why didn't you tell us if she won or not? Isabel wanted to travel more than anything in the world. She wanted to get out of her small town of Willow and see other interesting places. The baking contest was a way for Isabel to do that. Sometimes I don't like how our society is so focused on WINNING. Isn't the journey to the final game, contest, show, whatever, really what's important? We learn things about ourselves, our world, and other people through those journeys, and I wanted readers to see that. As for whether she won or not, see the next question and answer. Question #5 - Is there going to be another book? Yes!!! I'm so excited, there will be another book! 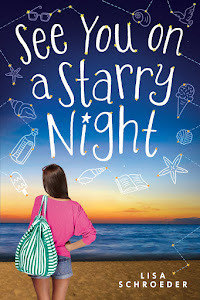 It's going to be a companion novel rather than a sequel, told from Sophie's (Isabel's best friend) point of view. It's scheduled to come out September 20, 2011, and is called SPRINKLES AND SECRETS. And yes, I will make sure you find out if Isabel won the baking contest or not, okay? Okay! Thanks to those of you who have read IT'S RAINING CUPCAKES and enjoyed it. The fact I get notes from readers, even if some of them are a bit unhappy that they have questions left at the end of it, shows I did what I set out to do - write a book that people would enjoy and remember. Here you go - have a cupcake, awesome readers!! Lisa, thank you for this update. The timing was perfect since I finished reading the book with my son yesterday. Of course, after I read this I went to my husband and told him about the ending and we are now debating/discussing it. I will be pointing to this post when I write my review on Tuesday Tales in the next week or so. 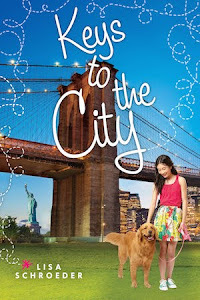 If i like the books confetii girl and finally 12 do you think i will like this book? hi lisa i am reading the book now and what are the main conflicts? Hi there, sorry, I can't do your homework for you! But here are some things to think about to help answer that question. What does Isabel want to do more than anything in the world? Why can't she do it? What is she working toward the whole time in the book? That's the conflict or problem, the thing the character wants but is having trouble getting. HI Lisa I finished your book Its Raining Cupcakes about 2 weeks ago and loved it first thought its probably magical,but i found out its not and now im doing a book report on it and and most likey to read others by you! Could I have a good quote in the book for an in class discussion? Hi Rainbow - I'm sorry, I can't do your homework for you. Do you have a copy of the book? Just flip through it and try to find a quote that speaks to you. What about when Isabel is talking to her grandma about her troubles, when they're washing the dishes together? Or what about something Lana says to Isabel when they're finger painting together? I'm sure you can find something that will work - good luck! Hello I absolutely love your books! Im not sure you remember me but my name is Lauren and I messaged you on you tube twice. I truly admire your work! My Favorite is Its Raining Cupcakes! I Love Your Books So Please Write More!!!!! Hi Lisa I loved your book It's Raining Cupcakes I finished it 1 week ago and I'm doing a Book Report (scrapbook)and my question is who was exactly lana? and wht was Isabels point of view? im really exited to read your other book sprinkles and secrets!! Lana was Isabel's neighbor. Remember, Isabel painted a picture in her apartment with her? I'm not sure what you mean by what was Isabel's point of view? The book is written from Isabel's point of view, which means Isabel tells the story, so you see everything from her eyes. In Sprinkles and Secrets, it's told from Sophie's point of view, so you see the story through Sophie's eyes. That's what point of view means. Hi Manshi, It's so hard to remember how I felt when I wrote a specific passage. I think I mostly felt like Isabel figured out that sometimes you have to realize that experiencing what's right in front of you can be just as wonderful as going somewhere new. I really loved your books and Im on my way to getting the complete set of your sweet treats books! Only have Frosting and Friendship left! Btw, your book covers are really great! Thank the illustrator for me, please! Hi Agnes - thanks so much for stopping by and letting me know you've enjoyed the books. I love the covers too. :) I gave her a big thank you in the last book's acknowledgements. Hi Lisa!!! I absolutely love your book series! Its my most favorite one! I'm looking forward to start some of your other series! You're doing a great job , thanks for being the greatest author ever! Hi Lexi, I'm so glad you've enjoyed the series. The first two books in the CHARMED LIFE series come out the end of May! hi Lisa!!! I am reading the book right now and I have question what does Isabel chose to do what she wants or bake with her mom. Hi Bryson - I'm not sure I understand your question. "Do what she wants or bake with her mom?" Are you talking about the recipe she enters for the contest? She decides to enter a cupcake recipe like her mom wants. But there's a surprise around this toward the end of the book, so keep reading! Hi Lisa. I am a young reader at 11 years old. Thanks to you I love reading. I love all of your books especially its raining cupcakes. Please Please PLEASE come up with more books just like its raining cupcakes, etc. Yours truly, A new cupcake lover. Hi Savini - I'm so glad you enjoyed It's Raining Cupcakes and its two companion novels. I have a brand new series out called CHARMED LIFE that is also about friendship that I think you might like! Four girls meet at summer camp and think they've found a lucky bracelet and agree to mail it back and forth to each other and share what happened while they had the bracelet. Thanks again and hope you have a great summer!!! Do you have questions by chapters for all your books? I'm looking for questions for Charmed Life: Mias Golden Bird. Hello! I love to bake and this is my absolute favorite book series. 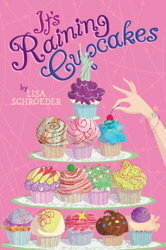 Are you planning on adding a book to the It's Raining Cupcake Series?